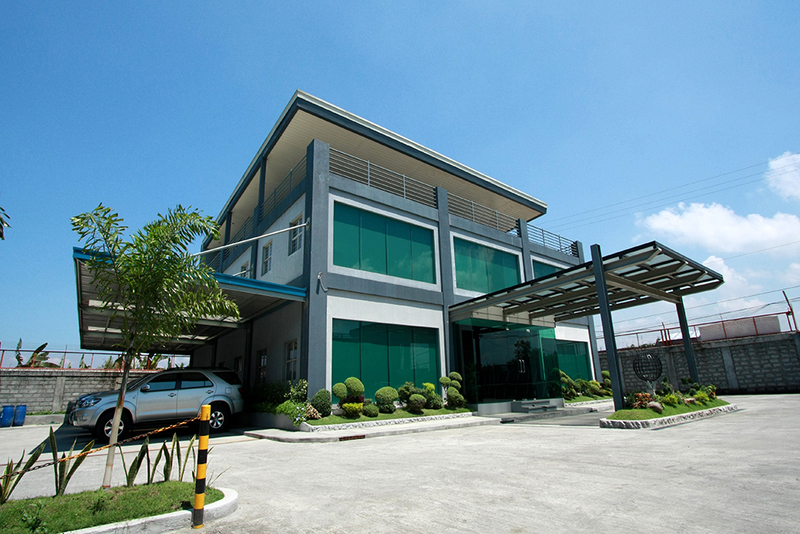 AMSTEEL STRUCTURES, INC. is a family owned steel fabrication company located at 88-98 Velasquez St. Bangiad, Brgy San Juan, Taytay, Rizal, Philippines. It specializes in structural steel works from conceptualization, structural design, detailing, fabricating, and painting to installation. 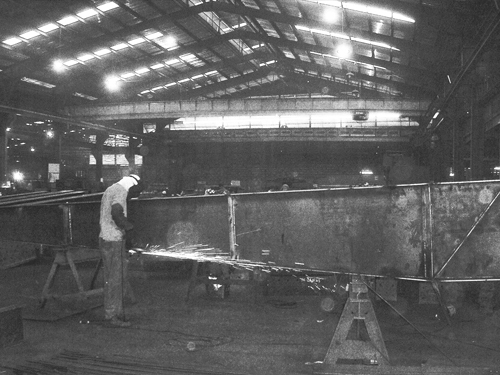 AMSTEEL had its humble beginning way back in 1977, as the Amigo Steel Fabricators company. Founded as a partnership between the children of our founder Kaw Bung Kai. 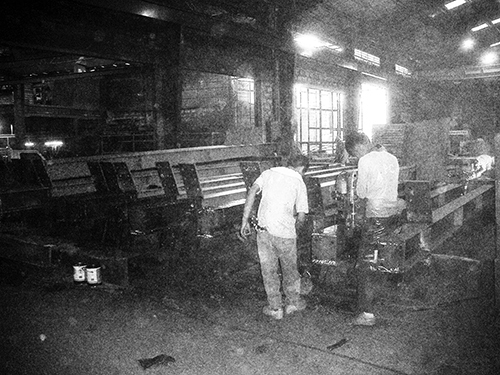 The roots of AMSTEEL STRUCTURES, INC. date back to 1977 where a partnership between the sons of the founder, Mr. Kaw Bun Kai, was formed and named Amigo Steel Fabricators Company. 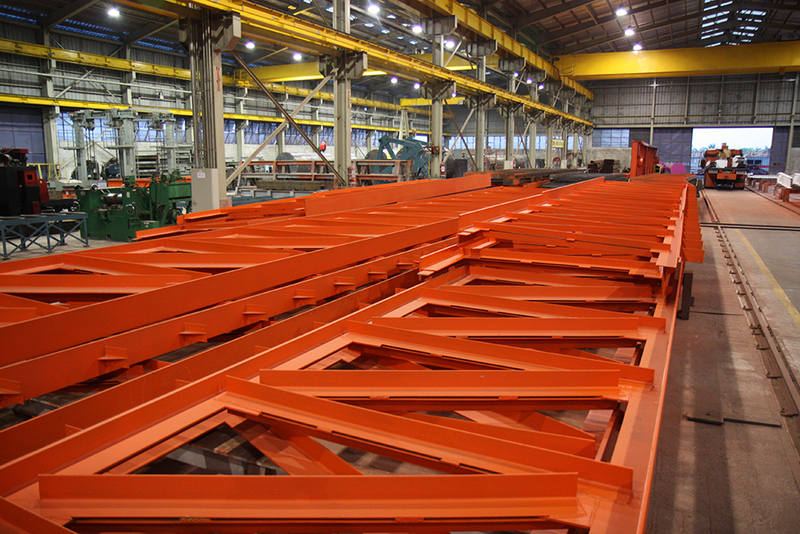 The company offered built to specs structural steel products. As a succession plan, the partners saw the need to include its next generation in the company. As a succession plan, the partners saw the need to include its next generation in the company. Hence in 1990, a corporation, Amigo Steel Industries Inc., was formed. 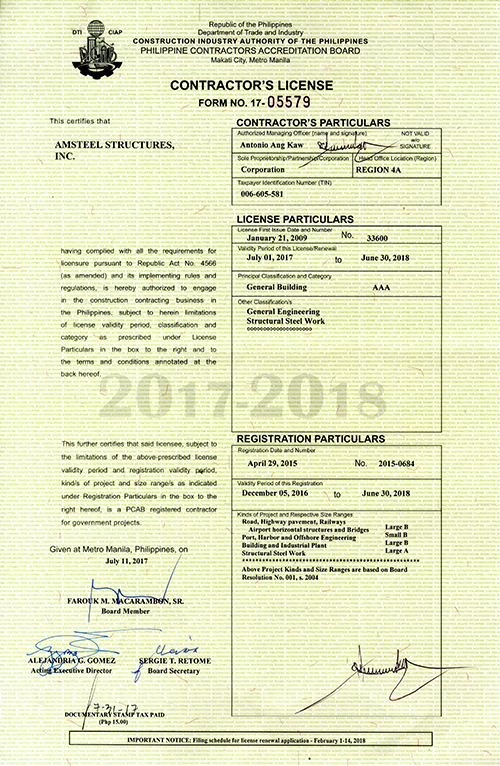 With years of experience in the Philippine business arena, the company, under its new name, offers fabrication and erection of a wider range of structural steel products such as bridges, trusses, rigid frames, pre engineered, pre fabricated structures, bolted steel carparks, built up I beams, hollow box sections, castellated beams, girders, columns, elevated water tanks, steel form works, etc. The company evolved into a globally competitive company with its acquisition of a 34,000 sqm property. The company evolved into a globally competitive company with its acquisition of a 34,000 m² property. 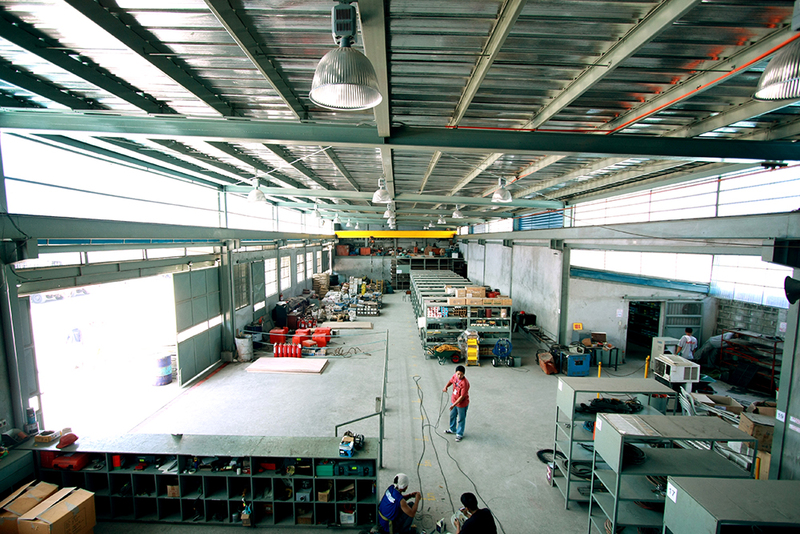 In 2007, AMSTEEL STRUCTURES INC. became operational with its new plant housing 19,000 m² including fabrication plant, office space, canteen & quarters, warehouse, autoblast machine and manual blasting room, 2.5 MW substation and backup generators. Each plant is equipped with state of the art machinery and material handling equipment. Certified ISO 9001:2008 and PCAB AAA Category accredited. 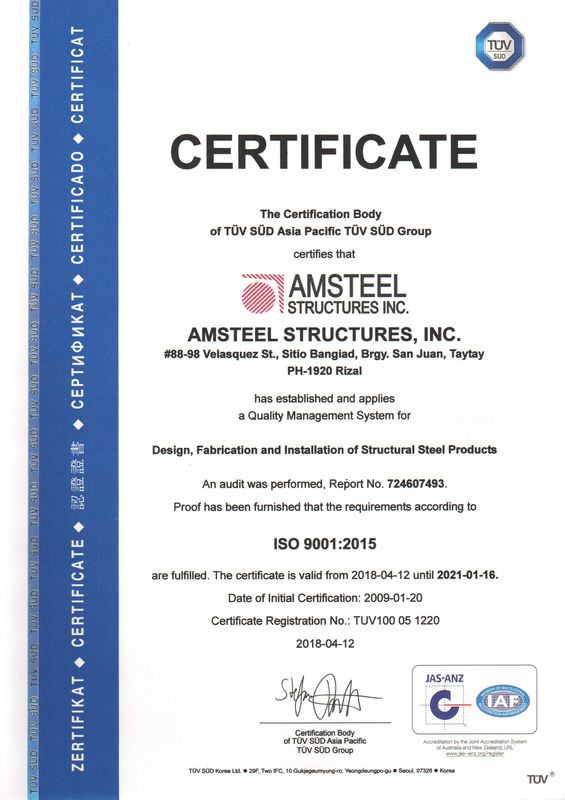 AMSTEEL STRUCTURES INC. is ISO 9001:2008 certified with Certificate Registration No. 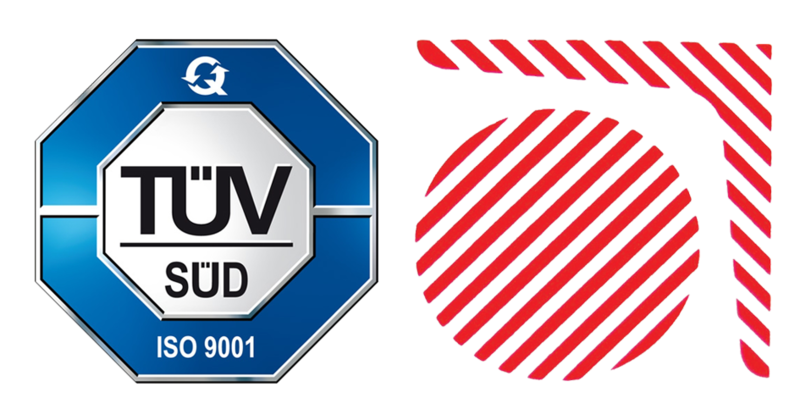 TUV100 05 1220. The company is also an accredited specialty contractor of Philippine Contractors Accreditation Board (PCAB) with PCAB License No. 33600 under the Classification of General Building with Category AAA. Guided by the principles of quality service and excellence, AMSTEEL STRUCTURES, INC. can now face the challenge of globalization.